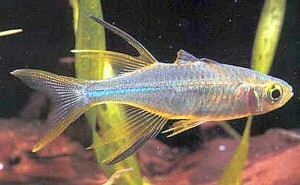 The Celebes Rainbow (Marosatherina ladigesi) formerly Telmatherina ladigesi, is a species of sailfin silverside endemic to the Island of Sulawesi (Celebes) in Indonesia and is found only near the town of Maros. They are also known to tropical fish keeping enthusiasts as the Celebes Rainbow Fish, Celebes Sailfish, and Celebes Sailfin. The Celebes Rainbow can be found in clear, slow flowing, fresh to slightly brackish water streams and estuaries in areas with high levels of dissolved oxygen where they spend a good portion of the day hiding among the leaves of plants eating insects, small worms, vegetable matter, etc. The Celebes Rainbow fish is a peaceful, slender, almost transparent schooling species that has a blue stripe that runs along the lateral line of the body. Males are larger, darker colored than females, and have more elongated black colored, second ventral and dorsal fins. Celebes Rainbow fish can be housed with other peaceful shoaling species in at least a 20 gallon aquarium that is densely planted with a sandy or fine gravel substrate, some smooth river rock, a few pieces of driftwood , and plenty of free swimming space. Some good tank mates include other hard water species such as similarly sized rainbow fish, live bearers, and smaller freshwater gobies. Like many rainbow fish they can be skittish and should be kept in small shoals of at least 6 to 8 of their own kind, preferably in a ratio of 2 to 3 females for every male. Natural lighting intensifies their colors, as does a dark substrate, but floating plants should be included to provide them with the dimly lit conditions they prefer. High water quality is essential to the well being of this species, so weekly partial water changes are recommended. Because they are so sensitive to water conditions, an “aged”, well aerated aquarium with good filtration is mandatory. The Celebes Rainbow is an egg scatterer that will drop their eggs among fine leaved plants, Java Moss , or in nylon spawning mops. Their breeding tank should be at least 18 inches long and filled with aged, slightly hard, alkaline water, kept at a pH of 7.5 and a temperature of around 72-74°F. No substrate is needed with the plants, moss or spawning mops but a small air powered sponge filter should be added for oxygenation and water flow. Condition a group by feeding them live or frozen food, select the best looking pair, and place them into the breeding tank. Drop the water temperature a couple of degrees and spawning activity should commence. The pair will continue to lay several batches of eggs attached by a small thread to the Java moss or spawning mops daily, for a period of several weeks or more. Depending on the water temperature, the eggs will usually hatch within 5 to 10 days and the fry will be free swimming shortly thereafter. After spawning, either remove the parents from the spawning tank or remove the plants or mops to a rearing tank to prevent the parents from eating their eggs. , or finely crushed flake food. The fry will remain at or near the water surface, so crushed floating foods are recommended over sinking varieties. The Celebes Rainbow is an omnivore that has a large mouth but a small throat. They eagerly eat a diet of fresh, frozen, or freeze dried bloodworms , brine shrimp, tubifex, or Spirulina in addition to a quality omnivore flake food. Several small feedings a day are recommended in lieu of feeding single large portions. 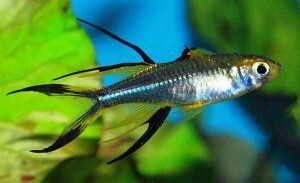 Wild Celebes Rainbow populations have been dramatically reduced because of pollution and over harvesting for the ornamental tropical fish keeping hobby however, European and Far Eastern farm bred specimens are readily available online and from specialty tropical fish keeping shops at sizes from 1-1/4″ to 2″. Wild caught specimens are seldom if ever available for purchase.